Jane Austen's novels have delighted readers for generations with their keen observations on the human condition and contain a wealth of practical insights and humorous quips on relationships, faith, family, love, character, and virtue. Celebrate Jane's wit and wisdom with this charming collection of quotes from the mouths of some of her most beloved characters and from her own letters. Inside this exquisitely designed book, you'll also enjoy rare photos from the British Library, selected Scripture verses, and personal prayers from the author herself, making this a must read for you or a welcomed gift for the Jane Austen enthusiast in your life. Join fellow Austenite and author of The Prayers of Jane Austen, Terry Glaspey, in revisiting Jane's most memorable and thought-provoking lines. 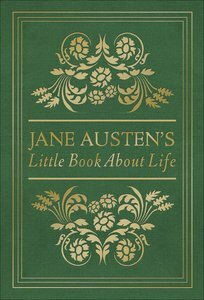 About "Jane Austen's Little Book About Life"
Jane Austen's life is striking for the contrast between the great works she wrote in secret and the outward appearance of being quite dull and ordinary. Austen was born in the small English town of Steventon in Hampshire, and educated at home by her clergyman father. She was deeply devoted to her family. For a short time, the Austens lived in the resort city of Bath, but when her father died, they returned to Steventon, where Austen lived until her death at the age of 41. Austen was drawn to literature early, she began writing novels that satirized both the writers and the manners of the 1790's. Her sharp sense of humor and keen eye for the ridiculous in human behavior gave her works lasting appeal. She is at her best in such books as Pride and Prejudice (1813), Mansfield Park (1814), and Emma (1816), in which she examines and often ridicules the behavior of small groups of middle-class characters. Austen relies heavily on conversations among her characters to reveal their personalities, and at times her novels read almost like plays. Several of them have, in fact, been made into films. Terry Glaspey has degrees in history and pastoral ministry and is the author of several books, including Not a Tame Lion: The Spiritual Legacy of C.S. Lewis and Pathway to the Heart of God. He is a passionate student of the Bible and a popular speaker for conferences and churches throughout North America.